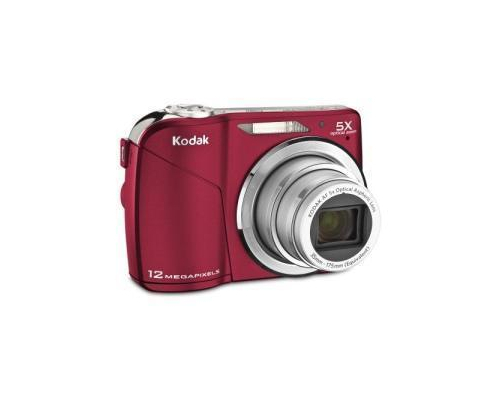 Kodak's EasyShare C190 Digital Camera is a low-cost point and shoot consumer digicam much like many other cameras in Kodak's EasyShare line. While it offers few features to set it apart from its competition, it is a functional entry-level camera for interested consumers. The C190 measures 3.7" by 2.5" by 1.2" and weighs 4.55 ounces without batteries. The C190 captures images using a 1 / 2.3" CCD with a total pixel size of 12.7 megapixels and 12.3 effective megapixels, a maximum resolution of 4096 by 3016. The camera has a 5x optical zoom and a 5x continuous digital zoom, configurable in .2x increments. The camera has a lens range between f/3.0 and f/4.8, equivalent to a 35 mm camera's range of 35 and 175 mm. The camera's shutter speed is between 1/1400 and 8 seconds, and it has a 2.7" LCD offering a resolution of 960 by 240 rated for indoor and outdoor use to compensate for the lack of a viewfinder. The camera also has 32MB of internal memory and support for SD and SDHC memory cards. The camera has a TTL-AF focus system. In normal shooting mode, it has a range between .6m and infinity in wide and between .9m and infinity in telephoto. In macro mode, it has a range between .1 and .7m in wide and .8 and 1m in telephoto, and in landscape it has a range between 10m and infinity. 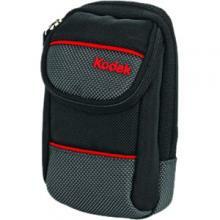 It offers a 5-zone multizone autofocus as well as a center zone autofocus. The camera's exposure control can be set between ISO 64 and ISO 400 when in automatic settings and manually to ISO 64, 100, 200, 400, 800, or 1600. Its metering modes can be set to TTL-AE, multipattern, center weighted, and center spot, and it offers exposure compensation between -2 and +2 EV with 1/3 EV steps. Its white balance settings can be set to automatic, daylight, tungsten, fluorescent, and open shade. The camera's flash has a range between .6 and 3.2m at wide and at ISO 200. At telephoto and at ISO 200, its range is between .9 and 2m. The camera offers auto, fill, red eye reduction, and flash off modes. The camera can be set to capture images using a 2-second or 10-second self timer as well as a 2-shot drive mode. It offers face detection and a number of shooting modes: Smart Capture, program (P), scene, sport, close-up, blur reduction, and video are all available. As a subsection of scene, it can be set to portrait, night portrait, landscape, night landscape, panorama R-L, panorama L-R, snow, beach, text, backlight, museum/manner, fireworks, high ISO, children, flower, self-portrait, sunset and candlelight. The camera's click to capture speed is less than .4 seconds in wide and less than .7 seconds in telephoto with the flash off. With the flash on, it's less than .7 seconds in wide and .9 seconds in telephoto, and the camera has a less than 1.3 second delay from shot to shot. The camera captures images at several resolutions and in many aspect ratios. In 4:3, the camera can capture images at 1280 by 960, 2048 by 1536, 2880 by 2160, and 3968 by 2976. In 3:2 the camera shoots at 1800 by 1200 and 3968 by 2640, and in 16:9 at 1920 by 1088 and 3968 by 2224. It offers high, natural, low, sepia, and black and white color modes and limited on-camera editing. The camera captures video using Quicktime motion JPEG with audio at resolutions of 320 by 240 or 640 by 480, both at 30 frames per second, and up to 4GB in size. It offers limited review and editing options on-camera. The camera includes a share button to make it possible to easily upload files to social media services. The camera connects to computers and printers via USB 2.0 and is powered by AA sized batteries. It has a 1/4" standard tripod mount. The camera cannot record in HD, which many other consumer digicams at comparable price points now can. Available accessories for the camera include high speed memory cards, battery chargers, a variety of cases, USB cables, AV cables, and various tripods (Gorillapod, a standard model, a mini model, and a handheld one).